In the 1800 and 1900s, train travel was the main mode of transportation in the United States. 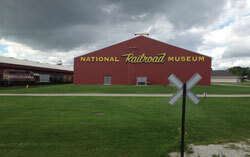 Learn about these majestic machines at the National Railroad Museum in Ashwaubenon, Wisconsin, just outside Green Bay. Founded in 1956, you'll find the largest railroad preservation in the United States. Over 75,000 people visit annually, where staff and volunteers are dedicated to educating the public about the railroad industry. The trains on display will amaze you, starting with the futuristic Aerotrain from the 1950s. Sit inside the Union Pacific Big Boy, the world's largest steam locomotive. The Lake Mitchell, a restored Pullman sleeper car from the 1920s shows how comfortable train travel was in the early part of the 20th century. Get a taste of life during WWII aboard the Dwight D. Eisenhower British Railways A4 Class No. 60008...which was used by the Supreme Allied Commander in Europe. 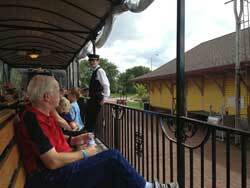 In addition to the exhibits, you can view a photography gallery and railroad artifacts. A standard gauge track circles the grounds, and an 80 foot wooden tower offers spectacular views of Green Bay and the Fox River. Don't forget to visit the Museum Store after your tour to pick up a railroad souvenir. The National Railroad Museum is open Sundays all year from 11am-5pm. The museum is closed on Easter, Thanksgiving, Christmas Eve and Day and New Year's Day.